The evening of June 23rd is Saint John Eve, it is the eve of celebration before the Feast Day of John the Baptist. The Gospel of Luke states that John was born about six months before Jesus. Therefore, the feast of John the Baptist was fixed on 24 June, six months before Christmas Eve. This feast day is one of the very few saint's days which commemorates the anniversary of the birth, rather than the death, of the saint being honored. The Feast of St. John closely coincides with the summer solstice, also referred to as Midsummer in the Northern hemisphere. The Christian holy day is fixed at 24 June but in most countries festivities are mostly held the night before, on St. John's Eve. This day is sacred to Vodou practitioners in New Orleans due to the ritual that Marie Laveau held in Bayou Saint John each year. This ritual was intended to cleanse and bless those who participated as well as to honor the spirits. This tradition is still carried on by Vodou practitioners in NOLA to this day and by people all over the world. This is a group service to honor him and petition a request from Marie Laveau. Enter your request in the "special instructions" area on your order. Photos will be sent 48 hours after the beginning of the service to insure enough time for offerings, prayers, photos etc. 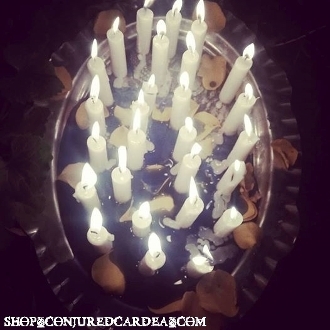 I will dress and bless one candle, in your name while praying for your petition, on my altar in honor of Marie Laveau.